A Blend of Anchor Butter & Rapeseed Oil with Salt. From the heart of the West country. Deliciously creamy. Lovingly made in the UK from 100% British milk. We prefer to keep it simple. Farmer owned - care in every step from cow to you. Contains no: palm oil, hydrogenated fats, artificial colourings or preservatives. Suitable for vegetarians. 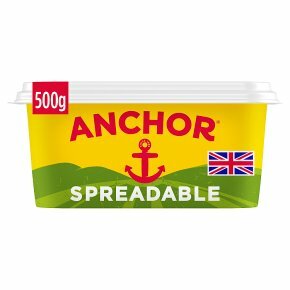 We've been churning butter for generations, but with rich Anchor spreadable, you can now enjoy it that little bit quicker! Deliciously creamy Anchor butter with rapeseed oil. Simple really, but we could go on about it 'til the cows come home. Welcome to Westbury, the heart of the West Country. Know for its famous white horse, and where Anchor butter is made using 100% British Milk.